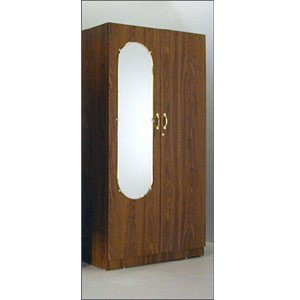 This Wardrobe Features Top And Bottom Shelf, Hanging Bar, Oval Mirror 12 In. x 48 In., And Lock. Melamine. Size: 36 In. (W) x 21 In. (D) x 72 In.(H). This Wardrobe Is Also Available In Custom Size. If You Would Like A Particular Size, Please Indicate The Size In The Shipping Comments Box Or Contact Us Via Email Or Telephone. *To See Colors Available Please Point At The Color Sample Picture Shown Left/Below. This Wardrobe can be Shipped Fully Assembled or Unassembled.